Thanks for applying with CashLady. Your application is still being processed. It’s just taking a little longer than usual. We are Processing your Loan Application. Please do not navigate away from this page. This may take up to 2 minutes to find a lender! Your decision will also be emailed to you in case of network issues. CashLady - A faster way to apply for a payday loan online. Secure your payday loan in just 2 minutes. No fees, no hassle, no problem. Choosing CashLady.com means your loan application will be seen by more direct lenders to improve your success rate. CashLady is a broker, not a lender. We are here to help you find the right loan when you need it most. Representative Example: Borrow £250 for 3 months. Number of repayments: 3. Each repayment: £137.21. Total repayable: £411.63. Interest rate per annum: 292% (fixed). APR 1272% Representative (Read more). Total cost is capped at 100% of the amount borrowed. Daily interest is capped at 0.8%. APR rates vary from 48.9% to 1333%. Thank you for choosing CashLady! Title Please choose Mr. Mrs. Miss Ms. Please let us know your regular outgoings. If you live with other individuals, only include your own expenses. Keep me informed about my loan application and other helpful products and services which I can opt out of at any time. 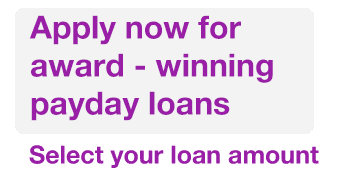 If you need to borrow money quickly and safely, submitting a payday loan application with CashLady guarantees you will be considered by multiple lenders in minutes. Our 256 bit encryption technology means your personal details are always safe and secure while we find you the best loan offer. A Payday loan is a form of short term credit, often used by people who require a quick cash injection to help them through a financial emergency. This type of personal finance has become increasingly popular in recent years. Consumers can make quick, discreet, online loan applications - often from the comfort of their mobile phone. The speed and convenience of a payday loan can be very important in an emergency. Because payday loans are designed to be borrowed over very short periods, the interest rate will normally be higher than longer term personal loans. A payday loan term could last from 61 days and up to 6 months. One of the UK’s oldest online credit brokers (Established in 2008). We help people with bad credit. Apply for loans with bad credit here. In 2016 we were awarded credit broker of the year and came runner up in 2017 and in 2018. What do you need to consider before applying for a loan? Before you make an application, it is important that you consider whether a payday loan is the best option for you and the situation you are currently in. This guide will help you understand the dangers of payday loans better. Please note, you can create long-term debt if you do not understand and use payday loans responsibly. How does an online application work? Applying for a loan online is usually straightforward. You will need to inform the lender of some key information about your personal and financial circumstances and in most cases, you will receive a decision within two minutes. If your loan application is successful, you will complete your credit agreement directly with your approved lender. Before your loan is approved your loan provider will carry out an affordability check and a full credit search to make sure you meet the requirements of their decision process. If successful, you could have the money in your bank account the same day (this can depend on the time of day you apply and the capabilities of your credit provider). Submitting your application at cashlady.com, you will receive a decision in less than 2 minutes. If approved, the money can often reach your account within the hour. (terms can vary from lender to lender). Everything can be completed online - from completing your application to signing your credit agreement. The Cashlady website is fully mobile optimised so you can manage your application process from anywhere. These rules help protect millions of borrowers by limiting their exposure to debt and making sure lenders put customer needs first. If you cannot meet your monthly repayments, inform your creditor about your financial difficulties first. This article explains what you should do when you cannot repay your debt. If you have any questions about CashLady or payday loans, visit our FAQ page for more information. You have not entered bank details. If you do not have a bank account click here to have your loan application assessed by a trusted lender.